Alcohol or Drug Detox. During this first phase, the patient must complete a detoxification process to rid the body of all chemical toxins, alcohol and drugs. Our professionals provide close medical supervision as withdrawal symptoms occur, ensuring that the detox process is as safe and comfortable as possible. Residential Treatment. We recommend an extended inpatient stay after detox. This provides the patient with sufficient time to stabilize, get centered and create a long-term plan for recovery. During this time, the patient focuses on understanding the cause(s) of his or her addiction through individual, group and family therapies. Aftercare. Intensive therapy after a residential stay keeps the patient moving forward. At an outpatient facility, the patient connects with others, learns coping mechanisms and grows to truly understand addiction. Post-treatment skills are taught so patients can deal with life’s daily stressors without turning to drugs or alcohol. Welcome to Buena Vista Recovery! Our goal is to help you or your loved one get on the road to recovery today — and to keep everything as simple as possible during what can be a stressful and trying time. You are NOT alone! So, where should you begin? To get started, simply pick up the phone. When you call 800-922-0095 or text “detox” to 555888, one of our highly trained, compassionate and understanding Treatment Advisor will help guide you through this process. Our admissions coordinators need to obtain some information about you or your loved one to more accurately assess the individual’s specific treatment needs. The information we collect includes substance abuse history, mental health history, medical history and current living situation. Utilizing the information provided, we begin to develop a treatment plan right away. Creating a plan from the very beginning helps to take a lot of the guesswork out of this process. Next, we need insurance information for you or your loved one. We accept most major insurance plans. Once we have this information, we will run a quick verification of benefits to see what is covered for you. Don’t have insurance? Our admissions coordinators will create a financial plan that works for you. Ask us how we can help you succeed! Once your treatment and financial plans are in place, we coordinate a date and time for arrival at Buena Vista Recovery to start the detox process. We can get you in at any time, as we are very flexible and understand each individual’s needs. With 24/7 admissions and nursing staff, we do our best to accommodate any situation. When you get to Buena Vista, you are greeted right away by our nursing and medical staff. They will guide you through the initial intake process. First, a nurse obtains vitals, gathers a urine drug screen sample and proctors a breathalyzer test. This is done to ensure your safety and well-being. Next, the nursing staff performs a variety of verbal intake examinations to assess your mental and physical condition. This includes a variety of mental health evaluations and a thorough gathering of your medical history. Our staff then sets up a medical plan to help you get through the detox process as comfortably as possible. You will be shown to your room and given time to settle in. For a virtual tour, click here. Once you have had time to get comfortable, our licensed clinician has some one-on-one sessions with you to help guide you through the beginning of your path to recovery. Also included are optional therapy groups offered throughout the day, Monday through Friday. Detox is only the first step. Buena Vista Recovery is fully staffed with a team that is armed and ready with the knowledge and resources to help you travel along your road to recovery. We will connect you to whatever resources you require so that you have all the tools you need to succeed. Transitioning into a life of recovery can be difficult at times. Buena Vista Recovery has gone to great lengths to provide the best services in the most comfortable environment available. We have all the information and experience necessary to assist you or your loved one through this process. Buena Vista Recovery is an adults-only facility; patients must be at least 18 years old. All financial arrangements for services must be approved prior to a patient’s admission. To better understand your insurance coverage, select the “Begin Treatment” option at the top of any page, or call our admissions team at 800-922-0095. Q. How do I know if I or a loved one really needs drug or alcohol treatment? A. Let one of our admissions coordinators assist you in answering the question of whether treatment is necessary for you or your loved one by calling now. When you call, our admissions team assesses your needs by going through a pre-assessment questionnaire. The pre-assessment can be done completely over the phone, and usually takes about 10 to 15 minutes. This series of questions helps us to ensure the best individualized care from a medical and therapeutic standpoint and to determine if our detox program will be a good fit for you or your loved one. Q. How long is the average detox duration or stay? A. The average stay varies depending upon each patient’s individual needs and what our attending physician deems necessary to detox safely and comfortably after evaluating the patient. Typically, you can expect your detox stay to be between 3 and 7 days. Q. What should I bring with me to detox? A. Bring your driver’s license or other form of ID, insurance card, personal toiletries, clothing, a notebook, and reading and writing materials. If you wish, you may bring personal items and pictures to help you feel at home. Q. Can I have my phone and other electronics? A. While you are a patient at Buena Vista Recovery, you are allowed to have your cell phone. Q. Will I have my own room during my stay at Buena Vista Recovery? A. Yes, while you stay at Buena Vista you have a private room. Please note that when at full capacity, an unlikely situation may occur that requires shared rooms for a few patients for a limited amount of time. When this happens, we strive to have patients who have been here for the longest duration room together so that those just arriving can have their own space to get settled and comfortable. Q. How often will I see the doctor while in detox? A. Within the first 24 hours after your arrival to Buena Vista, you will have your first doctor’s visit. After this initial evaluation, a medical treatment plan will be made based on your individualized needs. An attending physician is in the office each day and nursing staff are on site 24/7. If the doctor decides that you need to see her on a daily basis, then this will be scheduled. Otherwise, you will see the doctor based on your treatment plan and your progress while in treatment. Q. What kinds of medications will I be given for detox? A. The types of medications given for detox depend upon what our doctor decides will be the safest and most effective route for you based on the substance(s) being used and your individual medical needs. However, several medications are used frequently to help aid in the detox process, including Suboxone, Subutex, Ativan, Klonopin, and several other medications to help with anxiety, sleep, blood pressure, muscle cramping, etc. Q. May I have visitors while I am a detox patient at Buena Vista? A. While we do not regularly allow visitors while you or your loved one is a patient at Buena Vista Recovery, a visit can be approved in certain cases. The duration of stay is usually so short (between 3 and 7 days) that we strive to allow the patient enough time to rest and get through the hardest part in beginning his or her recovery from substance use. However, every patient is different, so visitation may be approved upon request. Q. May I make phone calls to family or friends while a patient at Buena Vista? A. Yes, call friends or family while you are a patient at our facility. We hope to keep families and friends as involved in our patients’ recovery as possible. Each day between 5 p.m. and 8 p.m., patients may make phone calls to their loved ones. We can also accommodate calls at different times, as needed and upon request, as we understand that not everyone can be available during our specific time slot. Q. How often will I see a counselor while I am a patient at Buena Vista? A. Upon arrival, each patient meets one-on-one with our counselor for 45 to 60 minutes. As every patient has a unique individualized treatment plan, the frequency of one-on-one visits with our counselor is based on the needs of each patient. If necessary, our counselor will meet with you on a daily basis. Additionally, therapy groups that are available to all patients are facilitated Monday through Friday at various times. These groups are not required but are strongly encouraged. We hope that everyone will want to be active in starting his or her recovery and will participate and get involved! Q. Can I smoke while I am at Buena Vista? A. Yes, the use of tobacco products is permitted throughout your stay at Buena Vista Recovery. Allowed products include cigarettes and chewing tobacco. Additionally, we can aid with smoking cessation products, such as nicotine patches or lozenges, while you are a patient at our facility. Q. How many patients will be there when I am there? A. 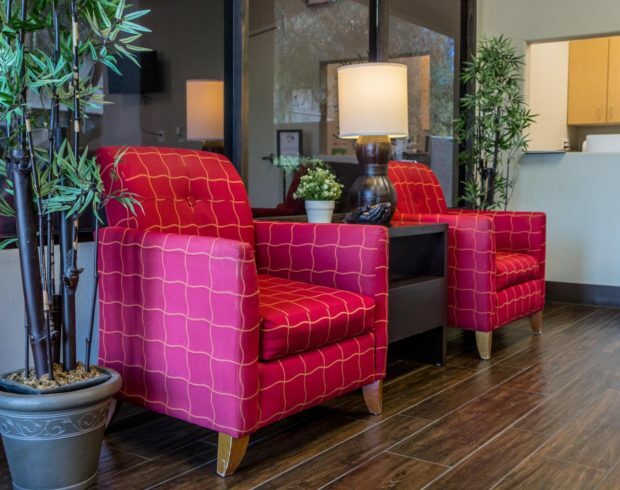 We pride ourselves on being a small facility, which gives us the ability to provide individualized care while you or your loved one is in detox. Our current maximum capacity is 14 inpatients at one time. Q. What activities are available while I am there? A. Therapy groups are facilitated a couple of times a day by our counselor; they are not required but are strongly encouraged! In addition, we offer a yoga class once a week, have multiple television rooms, and several games and other engaging activities that patients are encouraged to participate in as well. Q. Can I arrive at any time? A. Yes, at Buena Vista Recovery we are able to admit patients at any time of the day or night, 7 days a week.